Heating buildings via a collective District Heating network powered by sustainable sources is often the most economical and realistic option for cities to work towards their COP21 targets. Grenoble already has one of the most extensive heating networks in France. This is a high pressure/high temperature network. In the Flaubert district the buildings (300 new dwellings before 2020 and 11 000 m2 tertiary activity) will be energy efficient, which allows for an extension of the district heating network with a medium temperature (70 °C) and low pressure (LP). The main advantages are that (renewable) sources with a lower temperature can feed into the network and that heat losses during transportation will be reduced. Besides that, heating with a lower temperature means more indoor comfort. To further optimize this network and to show that renewable energy can be produced and used locally a thermal solar energy farm will be installed on the roof the cultural facility next door. This thermal solar energy will feed into the district heating network or into a 500 kWh heat storage using phase change material (PCM) technologies. With a smart management control system the environmental footprint of the LP heating network will be optimised. This system balances the available solar energy with the heat required by the buildings using the PCM storage and the buildings’ thermal mass. 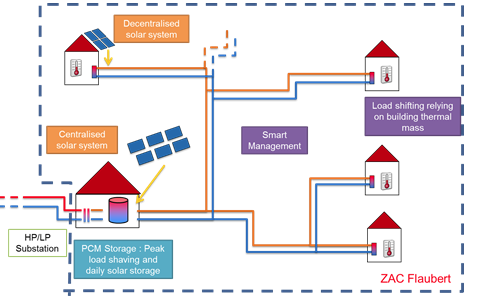 The installation of a LP LT District Heating network using locally produced solar energy and storage with PCM will result in a minimal environmental footprint. The research, planning and design of the network, PCM storage, solar system and control system is completed. The buildings on which solar systems can be installed has been identified. However, the implementation phase is depending on the building process of this new neighbourhood. It is expected that the HP/LP substation will be achieved in Q1 2018 together with the first building, building work has started in January 2017.